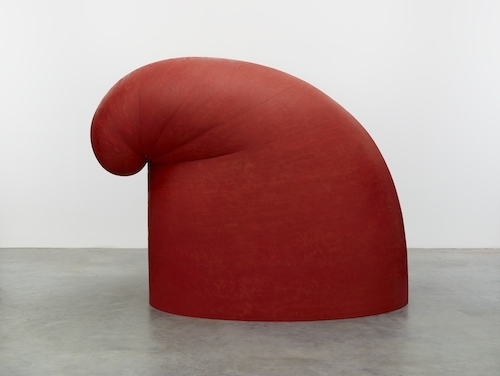 Martin Puryear, Big Phrygian, 2010-2014, red cedar, paint, 58 x 40 x 76". As 2014 came to a close, several questions lingered: What happened to the radicality of abstract spirit, both in the formal sense and in its political import? Where can those two essential elements meet in order to reinvigorate traditional art forms such as painting and sculpture and veer away from the decorative and mediocre? Martin Puryear’s latest exhibition inscribes the political within the abstract without yielding ground on either side. His work evokes a tension between the intelligibility of his sculptures as revolutionary artifacts and as concurrently pleasurable experiments in nonrepresentational form. The Phrygian cap, or red cap of liberty is an inspiration through out, albeit a reference likely lost on the uninitiated viewer. Big Phrygian, 2010–2014, is the work among this group most legible as a cap, and yet it is also a large, painted piece of cedar sitting on the floor, its relative size and historical remoteness from the titular object reducing its readability. Phrygian Spirit, 2012–14, a delicate work made of Alaskan yellow cedar, holly, ebony, leather, string, and milk paint, presents a tension between its two endpoints—a suspended pendulum-like ebony ball suggesting uncertainty and, on the other end, a stabilized rod attached to the wall representing immobility. Does liberty oscillate between these two extremes? Stepping back, Phrygian Spirit takes on the shape of the cap, the symbol of the antiroyalist forces of the French Revolution and the Rights of Man, which were catalysts for the Haitian Revolution. In our age, what embodies the Phrygian spirit? The protesters in the street? Puryear adroitly unpacks such questions with a repetition of formal elements.